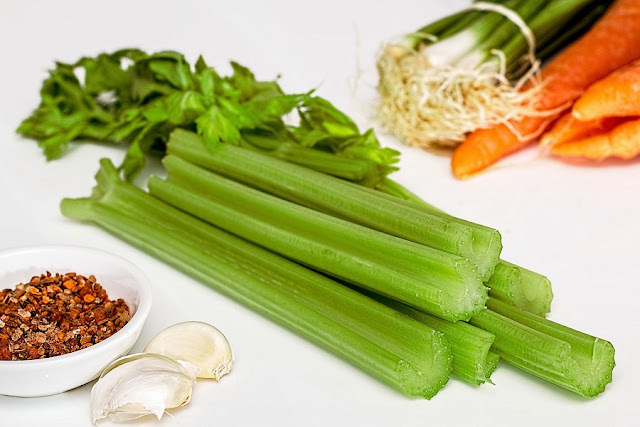 Celery (Ajmoda) is a herb from the Apiaceae family which also includes carrots, parsley, fennel, and caraway. This herb is commonly used as a vegetable. This vegetable is low in calories and high in dietary fiber and hence forms an important part of weight loss diet. (i) The most common one available and widely used is the Pale green pascal celery. (ii) Another one is the Golden celery which is cultivated under a layer of soil to prevent it from developing and turning green. Like other green vegetables from its family, celery also grows in bunches of long ribbed stalks with leafy tops. The inner ribs of celery is called celery hearts, and wild celery is known as smallage. This herb has a bitter taste, and its stalks are more bitter in comparison to the cultivated celery. Celery are known as ‘Ajmoda’ in Hindi, ‘Vamaku’ in Telugu, ‘Kaccharakku’ in Malayalam, ‘Ajamoda oma’ in Kannada, ‘Ajamoda’ in Gujarati, ‘Ajmod’ in Marathi, ‘Kernauli’ in Punjabi, and ‘Ajagandha’ in Bengali.